Persistence Market Research offers a 10-year forecast for the global energy harvesting equipment market between 2018 and 2028. In terms of value, the energy harvesting equipment market is expected to register a steady CAGR during the forecast period. This study demonstrates the energy harvesting equipment market dynamics and trends globally across eight regions: North America, Latin America, Western Europe, Eastern Europe, SEA and Others of APAC, China, Japan, and the Middle East and Africa, which influence the current nature and the future status of the energy harvesting equipment market during the forecast period. This research report provides a detailed analysis of the global energy harvesting equipment market and offers insights about the various factors driving the popularity of energy harvesting equipment and its features. The report includes an extensive analysis of the key drivers, restraints, trends and market structure. The market study provides a comprehensive assessment of stakeholder strategies and imperatives for succeeding in the business. The report segregates the energy harvesting equipment market based on the energy source, end user, industry vertical, product category, and across different regions globally. The market is expected to witness moderate revenue growth during the forecast period owing to an increase in the adoption of energy-saving equipment by commercial, residential, and industrial sectors. The report starts with an overview of the energy harvesting equipment market in terms of value. In addition, this section includes an analysis of the key trends, drivers and challenges from the supply, demand and economy perspectives, which are influencing the market. With respect to the energy source, the thermoelectric subsegment is expected to register the highest growth in the global energy harvesting equipment market. Under the end use segment, the commercial subsegment is expected to dominate the global energy harvesting equipment market throughout the forecast period. On the basis of industrial vertical, the home & building automation subsegment is expected to register the highest market share in the global energy harvesting equipment market by the end of the forecast period. On the basis of the product category, the energy harvesting ICs subsegment is expected to witness a higher growth rate as compared to other products. A detailed analysis has been provided for every segment of the energy harvesting equipment market in terms of market size across different regions. This section provides a detailed analysis of the key trends of the energy harvesting equipment market in each region. The next section of the report consists of a detailed analysis of the energy harvesting equipment market across various countries in different regions. It provides a market outlook for 2018–2028 and sets the forecast within the context of the energy harvesting equipment market to include the latest technological developments as well as offerings. This study discusses the key trends within countries that contribute to the growth of the energy harvesting equipment market as well as analyses the degrees at which the drivers are influencing the market in each region. Key regions and countries assessed in this report include North America (U.S. & Canada), Latin America (Brazil, Mexico, & the rest of Latin America), Western Europe (Germany , France, UK, Italy, Spain, Benelux, & the rest of Western Europe), Eastern Europe (Russia, Poland, & the rest of Eastern Europe), SEA & others of APAC (India, Oceania, ASEAN, & the rest of APAC), Japan, China, and MEA (GCC Countries, Turkey, South Africa, North Africa, & the rest of MEA). The global market report evaluates the present scenario and the growth prospects of the energy harvesting equipment market in various regions globally for the period 2018 –2028. We have considered 2017 as the base year and have provided data for the remaining 12 months. To offer an accurate forecast, we have started by sizing the current market, which forms the basis of how the energy harvesting equipment market will grow in the future. Given the characteristics of the energy harvesting equipment market, we have triangulated the outcome of different types of analysis based on the technology trends. As previously highlighted, the global energy harvesting equipment market is split into a number of segments. All these segments in terms of energy sources, end user, industry vertical, product category, and different regions are analyzed in terms of basis points to understand the relative contribution of each segment to the growth of the energy harvesting equipment market. This detailed information is important for the identification of the various key trends of the global energy harvesting equipment market. In addition, another key feature of this report on the global energy harvesting equipment market is the analysis of all key segments in terms of absolute dollar opportunity. This is traditionally overlooked while forecasting the market. However, absolute dollar opportunity is critical for assessing the level of opportunity that a provider can look to achieve, as well as to identify the potential resources from a sales and delivery perspective in the global energy harvesting equipment market. In the final section of the energy harvesting equipment market report, we have included a competitive landscape to provide clients a dashboard view based on the categories of providers in the value chain, their presence in the energy harvesting equipment portfolio and key differentiators in the global energy harvesting equipment market. This section is primarily designed to provide clients an objective and detailed comparative assessment of the key providers specific to a market segment in the energy harvesting equipment supply chain and the potential players in the market. Report audiences can gain segment-specific vendor insights to identify and evaluate key competitors based on an in-depth assessment of their capabilities and their success in the energy harvesting equipment market. Detailed profiles of energy harvesting equipment manufacturers and providers are also included in the scope of the report to evaluate their long-term and short-term strategies, key offerings and recent developments in the energy harvesting equipment market. Key competitors covered in the global energy harvesting equipment market report includes Tigo Energy, Inc.; greenTEG; EnOcean GmbH; Murata Manufacturing Co., Ltd.; Ocean Harvesting Technologies AB; UTAG Green Energy Technologies Inc.; ReVibe Energy; SolarEdge Technologies Inc.; Renesas Electronics and Cymbet Corporation. UTAG Green Energy Technologies Inc.
Energy harvesting equipment is adopted by several countries due to its multiple benefits. Nowadays, governments and public initiatives for saving energy are among the major factors responsible for the growth of the energy harvesting equipment market. Public and private companies are considering energy harvesting equipment as a key tool for meeting the rising demand for energy. Several countries of different regions are offering incentives and investments for the research and development of energy harvesting equipment. On the other hand, the development of Big Data and IoT technologies and the need for the replacement of batteries are among the key factors expected to drive the global energy harvesting equipment market. In this report, PMR has segmented the global energy harvesting equipment market on the basis of energy resource, end user, industry vertical, product category, and region. Based on energy resource, the global energy harvesting equipment market is segmented into thermoelectric, piezoelectric, radio frequency, photovoltaic, and other subsegments. On the basis of end user, the global energy harvesting equipment market is segmented into commercial, residential, and industrial subsegments. On the basis of industry vertical, the global energy harvesting equipment market is segmented into aerospace & defense, home & building automation, government, consumer electronics, and others. On the basis of product category, the global energy harvesting equipment market is segmented into energy harvesting ICs, energy harvesting sensors, and energy harvesting storage subsegments. However, the adoption of energy harvesting equipment solutions by the home and building automation sector has been high since its inception owing to the high demand for energy saving. Despite a lot of integration of energy harvesting equipment, automotive and aerospace & defense are currently the main markets for energy harvesting technologies. Energy harvesting equipment solutions have also been adopted by various governments and organizations to deal with unprecedented emergencies or failure of any device. In addition, the increasing adoption of consumer electronics is also expected to correspondingly increase the global adoption of energy harvesting equipment solutions. Based on end-user, the energy harvesting equipment market is subsegmented into residential, industrial, and commercial. The growing disposable income of consumers and the increasing adoption of advanced consumer electronic devices such as smartphones and laptops across the globe, especially across developing countries such as China, India, etc. are some of the major factors driving the residential subsegment in the global energy harvesting equipment market. In addition, owing to the low adoption of energy harvesting equipment across the commercial segment, it is expected to witness a comparatively lower CAGR in the global energy harvesting equipment market. The energy harvesting equipment market in Latin America is estimated to expand at a significant CAGR in terms of value over the forecast period. Moreover, the energy harvesting equipment market in Eastern Europe is also expected to witness significantly high growth. 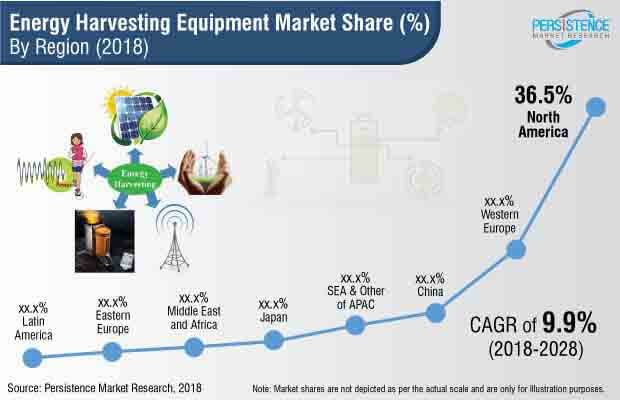 The market in the Latin America, SEA & Others of APAC, and Eastern Europe regions is expected to present the most attractive opportunities for energy harvesting equipment manufacturers, followed by the MEA and China markets. On the basis of geography, the energy harvesting equipment market is segmented into various regions, which include North America, Latin America, Europe, China, Japan, SEA & Others of APAC, and Middle East & Africa. The North America energy harvesting equipment market is expected to dominate the global energy harvesting equipment market due to the high adoption of green energy technologies in the U.S. and the availability of resources for offering advanced energy harvesting equipment experiences to the end-users in the region. The region has witnessed the adoption of energy harvesting equipment due to the rising penetration and manufacturing of consumer electronic devices, enterprises are rapidly adopting intelligent energy harvesting equipment. Enterprises are becoming increasingly dependent upon energy harvesting equipment to store, access, monitor, and manage the flow of stored energy. According to PMR analysis, to offer high-performance energy harvesting equipment services with cutting-edge technology and cater to the rising demand for energy harvesting equipment, prominent vendors in the energy harvesting equipment market are now focusing on acquiring, merging or collaborating with other players in the energy harvesting equipment market. Some of the vendors in the energy harvesting equipment market profiled in this study include Tigo Energy, Inc.; greenTEG; EnOcean GmbH; Murata Manufacturing Co., Ltd.; Ocean Harvesting Technologies AB; UTAG Green Energy Technologies Inc.; ReVibe Energy; SolarEdge Technologies Inc.; Renesas Electronics and Cymbet Corporation.